Facility Manager Keith Johnston talks about wind turbine energy May 24 at the Idaho Wind Partners' Yahoo Creek project south of Hagerman. The company owns 11 wind projects in Twin Falls, Elmore and Cassia counties. Four of Idaho Wind Partners' 14 wind turbines at its Yahoo Creek project sit idle May 24 south of Hagerman. 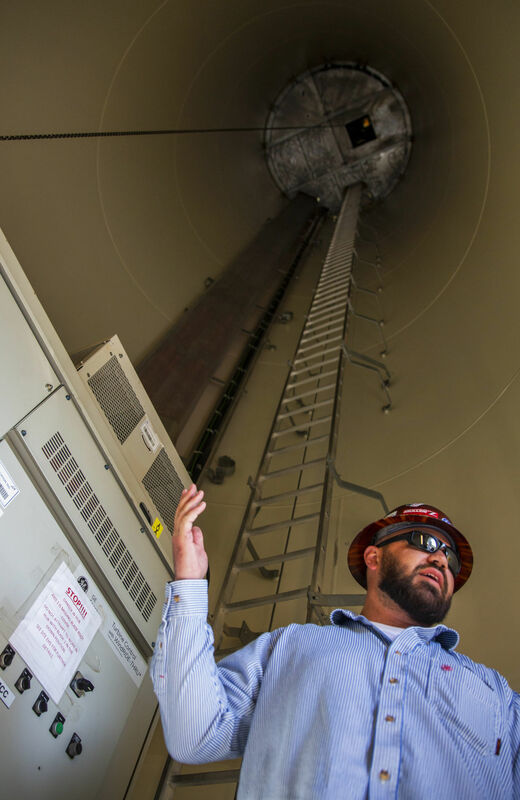 Facility Manager Keith Johnston explains how the wind turbine works from inside of one May 24 at the Idaho Wind Partners' Yahoo Creek project south of Hagerman. Area Operation Supervisor Stanley Bell explains how the plant operates May 17 during a tour of the Twin Falls Power Plant in Twin Falls. Office Manager Jamie Earl talks about the wind turbine industry May 24 at the Idaho Wind Partners' Yahoo Creek project south of Hagerman. Water is sucked into the original 1935 hydroelectric plant May 17 at Twin Falls Power Plant in Twin Falls. Facility Manager Keith Johnston explains how the main turbine computer works from inside the turbine May 24 at the Idaho Wind Partners' Yahoo Creek project south of Hagerman. How is water converted to energy? Facility Manager Keith Johnston talks about wind turbine energy May 24 at the Idaho Wind Partners' Yahoo Creek project south of Hagerman. Control panels display information May 17 at the Twin Falls Power Plant in Twin Falls. These manual switches will soon be replaced with touchscreen panels. A wind turbine sits idle May 24 at the Yahoo Creek project south of Hagerman. Area Leader Ryan Merrick explains the functions of the different panels in the control room May 17 during a tour of the Twin Falls Power Plant in Twin Falls. How is the sun converted to energy? Renewables are vital to Idaho’s energy production. So how did they get started and where are they going? TWIN FALLS – Idaho is at the forefront of a nationwide movement toward renewable energy. As of 2015, it ranked 44th in the nation for total carbon dioxide emissions, according to the U.S. Energy Information Administration. And as Idaho Power Co. seeks to cut carbon dioxide emissions, renewable energy sources will play an even bigger role in powering the Gem State. In southern Idaho, there’s plenty of room — and resources — to expand. With abundant waterfalls, sunshine, wind and open pastures, the region has piqued the interest of investors and developers. Today, most of Idaho Power’s energy comes from renewable resources, and many of those are right here in the Magic Valley. While renewable energy is more sustainable and reduces C02 emissions, some sources are more reliable — and predictable — than others. Whatever the future of Idaho’s renewables looks like, the state’s energy sources that produce more CO2, like coal, are being left in the past. Idaho has a long history with hydroelectric power, dating back to long before the Magic Valley was fully settled. The first electricity used in Idaho was by a mining company near Ketchum in 1882. Idaho Power formed in 1916, when five companies merged. It had five hydroelectric plants, the oldest being the 1901 Swan Falls plant on the Snake River about 40 miles south of Boise. Last year, the company’s 17 dams generated nearly half of Idaho Power’s total generation. Nationwide, hydroelectric plants account for only 7.5 percent of all the energy that’s generated. “In addition to that, we got about 19 percent of our energy from long-term purchases,” Richins said. These purchase agreements include generation from other hydroelectric facilities, plus projects like solar and wind farms. Idaho Power also has part ownership in coal plants, and owns three natural gas plants. “We’re a pretty full portfolio company now,” said Idaho Power spokesman Dan Olmstead. In 2017, coal generated 18.3 percent of the company’s total energy portfolio, and natural gas generated 8.3 percent. The U.S. average has been around 30 percent for coal, and 31 percent for natural gas. “Our rates are still among the lowest in the nation on a price per-kilowatt-hour basis,” Olmstead said. According to the EIA, the state ranked eighth in the nation in February for the lowest average retail price of electricity to the residential sector. Dams along the Snake River were a natural way to access the Magic Valley’s resources. But in the early 2000s and 2010s, Idaho Power started seeing more wind and solar contracts come in under the Public Utility Regulatory Policies Act of 1978. Because of the looming energy crisis, the act required utility companies to buy electricity from qualifying projects, such as solar farms. Wind energy came first, but solar followed. As of May 1, Idaho Power had PURPA contracts with 32 wind projects and 19 solar projects throughout the state. But these sources, Richens said, are relatively unpredictable and harder to rely on than hydroelectricity. In Boise, Idaho Power Co. staff constantly monitors the system for fluctuations. A common misconception is that energy can be stored and used for later. In some states it can be, but in Idaho, where there is no large storage facility, it must be managed on a real-time basis so the system remains balanced. “It’s not like there’s a battery that’s there storing it and releasing it,” Richins said. Electricity travels at the speed of light — 186,000 miles per second — and it’s constantly zooming in and out of the grid, being sent to wherever it will be used. “When you turn on your lights, that energy that you’re using at that moment was literally produced a second ago, possibly thousands of miles away,” he said. While Idaho Power specialists try to predict how much energy the system will receive, that can change in an instant. If a cloud blocks the sun, solar panel generation drops suddenly. With changes in the wind, turbines go on- or off-line. These sources can’t be relied upon for baseload needs, Richins said. “You can’t be guaranteed it’s going to be there when you need it,” he said. Idaho power produces most of the power it uses. And hydro is its lowest-cost option for energy, Richins said. But because it’s required to buy from PURPA contracted facilities, the company sometimes runs into an energy excess. It often happens during the springtime, when water is flowing, the wind is blowing and the sun is out — all while there isn’t a huge demand. This year was no exception. During boom times, non-hydro renewables can sustain the state’s power for a few days at a time, but they cannot carry the brunt of the energy load. “We had a couple days when wind and solar basically ran our system,” Richins said. Idaho Power can restrict the amount of energy it has to take from these facilities — and it can also try to reduce energy production at its hydro, coal and natural gas plants. But sometimes, that can’t happen quickly enough. “Even if we don’t need the energy, we have to take it, and if it’s too much, we have to take it to market,” Richins said. And when there’s a regional excess of energy, Idaho Power might not be able to even sell that power. Instead, with nowhere for the power to go, it’s forced to pay another company to take it. That can impact customer rates down the line. Idaho Power may pay $50-60 per megawatt-hour for solar, but then have to turn around and sell it for $15 per megawatt hour, Richins said. And that increases costs that the company must recuperate later. But not everyone agrees with that assessment. Robert Paul, developer with Alternative Power Development Northwest LLC, disagrees that solar and wind are a much higher-cost resource than hydro. But Paul believes Idaho Power has been resistant to renewable power. “The way that Idaho Power has structured the PURPA compliance makes it far more difficult than in other states,” he said. Paul was the developer of a solar project in Grandview a couple of years ago. Now, he’s working to construct a 100 megawatt solar project east of U.S. 93 and south of Rogerson. Another project just across the road would generate an additional 120 megawatts. These projects — the first solar projects in Twin Falls County — would also include a storage facility. “By using battery storage, we can fluctuate the time of day when we sell the power,” he said. The batteries could store about four hours of the project’s power, so energy generated during the day could be dispersed at nighttime. For now, he’s just trying to market it to the right partner. But he didn’t want to sign on for two-year contracts with Idaho Power, which he says are not long enough to bring certainty to his project. Instead, he’s looking at contracting with a utility in Nevada, where he says the market is more open and aggressive in getting renewable energy. Idaho Power, however, argues that two-year contracts have helped its company have more flexibility and save money with renewable energy. The company was once required to have 10-year contracts. In Idaho, companies see value in renewables. Idaho Power is required to sell credits from its renewable resources. The owners of those credits can then claim they use “green energy,” and the money Idaho Power receives goes to offset customer rates. As coal-fired generation represents less than one-fifth of Idaho’s energy supply, Idaho Power’s board has made a long-term commitment to reducing carbon dioxide emissions. It’s already made big steps. Between 2005 and 2017, the company’s coal-fired generation dropped 54 percent in megawatt-hours. The emissions intensity — based on pounds of C02 emitted per megawatt hour — had been reduced 25 percent. Idaho Power partially owns three coal plants in Oregon, Nevada and Wyoming. The company has plans to pull out of its Boardman, Ore., plant in 2020. The Valmy, Nev., plant has two units — one of which will be offline in 2019 and the other by 2025. “In theory, by 2025, we will have moved away from two of our coal plants,” Richins said. But Idaho Power is scheduled to be energy deficient by 2026. So if coal leaves, the company will need to find new sources to replace it. Idaho Power has laid out its options in its 20-year Integrated Resource Plan. The cheapest and preferred solution to the energy deficit is called the Boardman to Hemingway Transmission Line. This 300-mile line would run from outside of Boise to Boardman, Ore. This line would help Idaho Power in two ways: First, when the company needs more power, it would buy energy from the Pacific Northwest. Conversely, when Idaho Power has an excess of energy, the company could sell it to that region. In theory, this would benefit both regions because the northwest typically has peak usage in the winter, but Idaho Power has peak demand in the summer, Richins said. The cost of running that line would be comparable to coal, but it would result in fewer carbon dioxide emissions because the Northwest uses mostly renewable energy sources too. Meanwhile, Idaho Power expects that wind power, especially, will become increasingly enticing to developers. “Wind kind of paved the way for renewables in a lot of ways — but solar is starting to catch,” Richins said. The cost of solar has dropped dramatically in recent years, making it a more viable option — plus, there’s a 30 percent federal tax credit on solar developments. Richins predicts that innovation will continue to make technologies like solar and battery storage more affordable. “We have a glide path away from coal,” he said. Editor's Note: This story was updated June 11 to clarify Idaho Power owns three natural gas plants. A previous version of the article said the company was a co-owner in those plants. Shame on you Idaho Power. This is a company that has resisted any methods to stabilize the energy available to customers other than building huge transmission lines that damage the environment. They have been unwilling to provide more than 2 year contracts for battery storage discouraging this type development, have been unwilling to include it in their Integrated Resource Plan. Have claimed that they will be closing down coal plants that they do not have the authority to close down early, plan to allow heir contracts for wind energy expire, and have used all kinds of manipulations including over stating the increased need in electricity where there is none, claiming agricultural users will have increased needs in spite of their statements that this is not so, etc. All these moves are focused on making unnecessary transmission lines appear to be needed. The entire focus of this company is to build new lines to obtain the guaranteed profits they will assure to shareholders at the expense of energy users.